Southbound (A417) traffic: Follow the A417 south and turn off at the Burford exit for the A429. At the roundabout take the third exit crossing over the top of the A417. Continue straight on at the next roundabout following the A429 towards Cirencester town centre. South–westbound (A429) traffic: Follow the A429 south–west until the traffic lights at the junction with the B4425 is reached. Turn right following the A429 and continue to the roundabout at the junction with the A417. Continue straight on taking the second exit crossing over the top of the A417. Continue straight on at the next roundabout following the A429 towards Cirencester town centre. Westbound (A417) traffic: Follow the A417 westward passing through Faringdon, Lechlade and Fairford. Continue on the A417 until the junction with the A429 is reached. the A429. At the roundabout take the third exit crossing over the top of the A417. Turn left towards Cirencester town centre. Southbound, South–westbound & Westbound traffic continued:At the next roundabout take the first exit continuing south on the A429 (Swindon Road). At the next roundabout turn take the fourth exit onto Bristol Road continuing on the A429. Westbound traffic: Follow the A34 north taking the Chieveley exit (do not miss this exit otherwise the nearest next exit is East Ilsley) and then turn right at the junction to cross over the A34. Northbound (A419) traffic: Follow the A419 north taking the exit towards Cirencester town centre and then at the first roundabout take the second exit onto Bristol Road (A429). ALL traffic continued: Continue straight on following the A429 across the next two roundabouts. At the next roundabout beside Cirencester College take the third exit towards Stroud onto the A419 (Stroud Road). Follow the A419 for 1.6 miles until the entrance to the park is reached – a well–marked right?hand turn off the A419. From that point onwards follow the signs and marshal instructions to the designated car parking area. 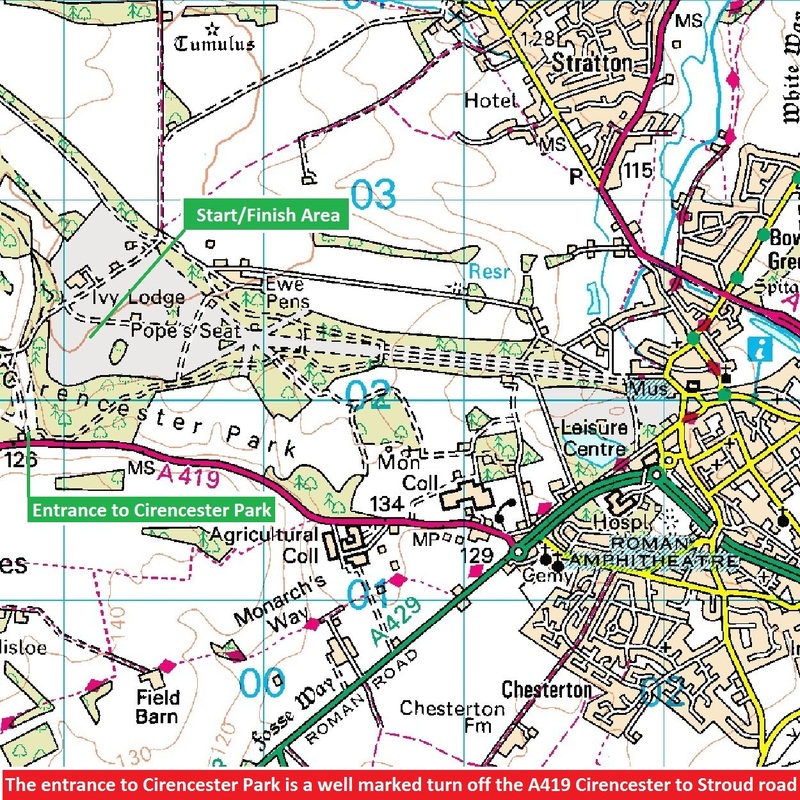 Notes: The entrance to the park is a well–marked right?hand turn off the A419 driving from Cirencester towards Stroud. PLEASE NOTE: Dogs are NOT allowed in Cirencester Park. Please Also Note: Further notices and updates relating to any restrictions will be posted here as the date of the fixture approaches and is required. Please ensure you revisit this page and re–check for any updates/changes before the date of the fixture. 2018 Cirencester Park XC Course Maps will be made available here at the beginning of the week before the fixture.